Experience the thrill of rafting with your family, friends or group. Learn the basics of raft and water safety and enjoy a trip down the river in rafts or duckies. Participants must be independent and manage self-care or bring a care-giver to provide assistance. All or part of these raft trips are conducted on Public Lands under special permit from the U.S. Bureau of Land Management. Licensed River Outfitter – Issued by Colorado Parks and Wildlife. 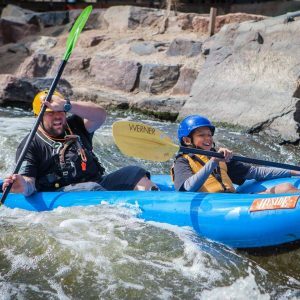 Come experience the thrill of rafting Class II/III rapids on the beautiful Upper Colorado River with your family, friends or group. Learn the basics of raft and water safety and enjoy your trip down the river in rafts or duckies. We offer a variety of adaptive equipment to make these trips safe, comfortable and enjoyable for the whole group. For a half-day option, we offer a four-mile trip through the Little Gore Canyon. 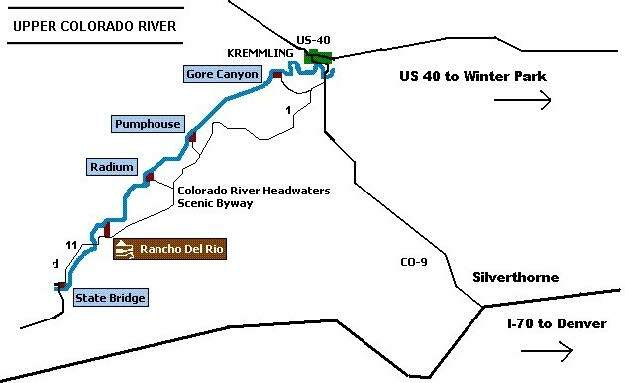 For participants looking for a full day of adventure and exploration, we also offer a 10 mile trip through the Little Gore Canyon and Yarmony Canyon. Both trips offer many opportunities to spot a variety of wildlife including bald eagles and their nests of eaglets, beavers, river otters, big horn sheep, mule deer, a variety of ducks, many types of trout and if your group is lucky you might even spot a black bear or a mink. All or part of these raft trips are conducted on Public Lands under special permit from the U.S. Bureau of Land Management. Licensed River Outfitter – Issued by Colorado Parks and Wildlife. Times: Arrive by 9:30am or 12:30pm to give yourself time to check in and use the facilities prior to the launch. Trips are 10:00am-12:00pm or 1:00-3:00pm, and they will launch promptly at 10:00am or 1:00pm. Times: Arrive no later than 9:30am. Trip will launch promptly at 10:00am. Trip is 10:00am-4:00pm with a half hour break for lunch on shore (Lunch is not provided by the Please come prepared with a sack lunch unless otherwise arranged prior). IMPORTANT REMINDER: the NSCD does not allow children under 5 years old to raft in our program.